Basic ingredients: Based in Leeds’ historic Kirkgate Market this community-focused cookery school offers two ten-week courses, ‘Beginners’ and ‘Continuing’. It’s open to people of all ages and backgrounds with a view to giving them the knowledge and confidence to cook healthy, balanced meals. Attendees range from the recently retired to young parents, and in the holidays they run short courses for teenagers. Chef Simon Chappelow guides students through all manner of tasty dishes, including curries, fajitas, soups and baked desserts. The classes also cover knife skills and handy tips. It’s a hands-on experience, with a quick demonstration followed by each student recreating the dishes. The open-plan work area is glitteringly clean and the equipment is good. Students can help themselves to a hot drink as they arrive, and at the end everyone packs up their creations to take home – the generous portion sizes make the price of the course even more impressive. You also get a recipe booklet in each session with plenty of tips and ideas, and some good feedback on healthy eating. The market location means any inspired students can stock up on fresh ingredients as they leave the class. Each of the courses runs for one and a half hours a week, Monday through Saturday, either morning, lunchtime or afternoon. Each session costs just £6, or £5.50 for Leeds Card holders. Leeds Card Extra holders and students get each lesson for the bargain price of £3.50. They say: Knowing how to cook from scratch means you’ll be able to turn all sorts of fresh ingredients into meals when they’re in season, at their best and at their cheapest. We say: This is a really relaxed and friendly environment – and as an added bonus you get to take home your dinner. Jamie’s Ministry of Food campaign is set up with support from NHS and local councils. There are five centres in England currently – the others are Bradford, North East, Rotherham and Stratford – and the campaign has also taken off in Australia and America. Read our latest Cookery School report here. I am interested in joining your Beginners cookery course. I have never cooked professionally. 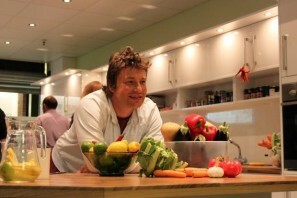 I love cooking and want to learn more and what better place to learn than at Jamie’s School. Iam a big fan of his cooking. I would like to know how to join and when’s the latest course starting. I want to join asap.